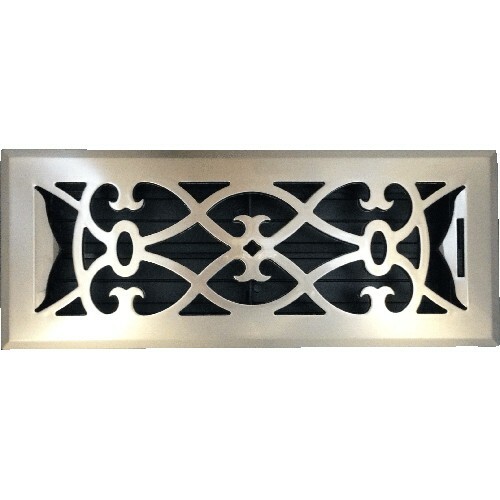 This Victorian register is finished in a satin nickel color and is the only decorative plastic heat vent cover in which we stock. 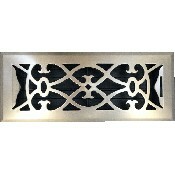 The one of kind heat vent cover has a plastic damper as well which is 100% rust and tarnish proof. The Victorian register can be adjusted for airflow for both your heating and cooling needs. Our heat vent cover is a durable and reliable decorative Victorian register; even though it is made out of plastic, it can hold up to 300 lbs of weight. This Victorian register is made with a high-density resin in order to withstand the pressure. Match your decor with a heat vent cover that brings style and class with its beautiful satin nickel finish. Faceplate is approximately 3/16" thick allowing moderate foot traffic and can hold up to 300 lbs. 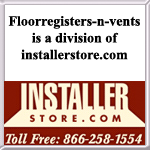 Tip: Do not measure existing heat vent covers when trying to order your replacements. The industry states that a 2 x 12 Victorian Register will drop into a hole opening that measures 2 x 12. We have other plastic heat vent covers that are offered in our contemporary design and which comes in your choice of finish. Snag this ornate Victorian register up today and have it delivered to your door for one low shipping cost!